The greatest Flamenco Player Alive! Important! : First read, then click! Or at the München Ticket Boxes, e.g. Marienplatz. 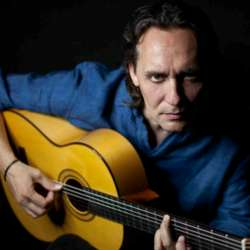 The Latingrammy Award winner Vicente Amigo - "the best guitarist alive" according to Pat Metheny - is idol for guitarists worldwide. His playing and his compositions impress with fiery virtuosity, outstanding charisma and the magical moment of the "duende". Outstanding creativity and technology mate with great sensitivity: the beauty of even soft tones, the combination of sophisticated musical arcs with a sure expression characterize his melancholic boleros, happy Alegrías to fast-paced and hard-played Bulerías. For Paco, Amigo was the best guitarist of the generations following him, precisely because he did not copy his style, but created unique new soundscapes. "Memoria de los Sentidos" ("The Memory of the Senses") also contains a requiem for Paco de Lucía, whose introductory stanza is sung by Amigo himself. Flamenco at its finest!